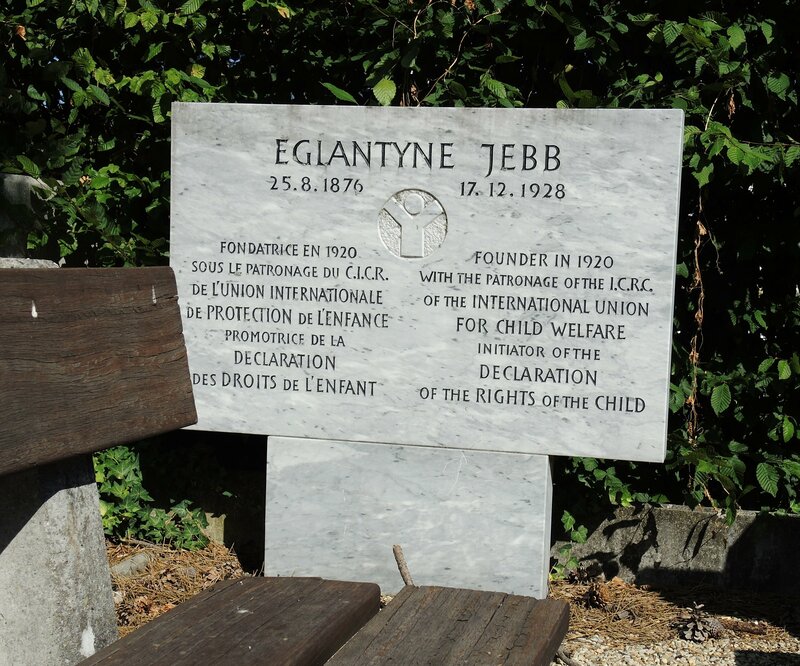 Memorial for Eglantyne Jebb, near the ICRC Headquarters. By Johannes Paulmann (Own work) [CC BY-SA 4.0], via Wikimedia Commons. On September 26, 1924, the General Assembly of the League of Nations adopted a Declaration of the Rights of the Child, which had been included at the request of the British delegation. The Declaration was drafted by Eglantyne Jebb, a prominent and well-connected British social reformer. The Save the Children International Union (1920), a Geneva-based international organisation of child welfare, helped promote it. The Declaration constituted the first document dedicated to the active and distinct promotion of children worldwide. Although its labelling is somewhat misleading for it listed promotional affirmations towards children rather than positive declarations of rights, the adoption of the Declaration still constituted an important event in the history of humanitarianism and human rights, for it implied that children, for the first time, gained the attention of the highest circles of international politics. The Declaration is based on a universal notion of childhood that constructed children as innocent and valuable human beings in need of special assistance, protection and guidance. Its preamble held that “mankind owes to the child the best that it has to give” and invited “men and women of all nations” to commit themselves to a set of duties towards the world’s children “beyond and above all considerations of race, nationality or creed”. The Declaration’s content was inspired by both an older tradition of child saving as well as the experience of World War I, which had brought unprecedented misery particularly to the youngest generations. The text not only appealed to the powerful idea of some sort of universal responsibility of adults to provide children with food, aid, shelter, relief, protection and education, it also spoke to children as symbols of the future and stressed the importance of their positive development for humanity at large. Since the early nineteenth century, children and specific ideas of childhood featured increasingly in the plans and activities of philanthropists and voluntary organisations in Europe and North America, many of which established homes for orphans or street children, campaigned against child labour, battled infant mortality, founded kindergartens and schools and organised food for the children of the poor. At the same time, religious groups and missionary organisations started to promote the saving of children in geographically distant lands. This included, among others, founding schools and orphanages in Africa and Asia, rescuing child slaves, battling infanticide and promoting what they perceived as proper Christian and civilized childhoods throughout the world. By 1900, humanitarian work among children had gained popularity, and giving resources for the children of others had become a familiar humanitarian practice. Owing in no small part to the efforts of Eglantyne Jebb, child-centred activism flourished in Europe in the aftermath of World War I, when many children had lost the protection of parents and young masses suffered from malnutrition. For instance, Jebb and her fellow activists had gained great popularity for the first time in post-war Britain, when they launched relief campaigns for Europe’s starving children and particularly the children in enemy countries like Austria and Germany. Similar movements developed elsewhere, and international relief for children continued to operate successfully throughout the Greco-Turkish War (1919–1922) and the Russian famine of 1921. Altogether, these various groups of activists had successfully advanced the powerful idea of the primacy of aiding the young, which also found expression in the Geneva Declaration; point three states that “the child must be the first to receive relief in times of crises”. At the same time, these activists also turned to children for political reasons, for it was in the figure of the innocent and educable child that they found hope for a peaceful and democratic future. While states and churches had been paying heightened attention to the education of the young as resources of the future since the nineteenth century, activist groups in interwar Europe embedded child welfare in their striving for international democratization and peace. Jebb and her fellow campaigners illustrated this by arguing that child-centred activism should be extended beyond relief work and should be pursued systematically and internationally. They thus moved on from doing relief work in the British Save the Children Fund (1919) to promoting the introduction of child welfare to international politics. They did so by creating the Geneva-based Save the Children International Union (1920), which promoted a view of children as both resources and symbols of larger social and political issues, and lobbied for children’s rights. Their endeavour met with some measure of success. In 1924, the Declaration passed and the League created a Child Welfare Committee, which consisted of political delegates of member countries and representatives of voluntary aid organizations that built an international network of experts and activists for the advancement of the professionalization of social work for children. The adoption of the Geneva Declaration marked a critical moment in the history of humanitarianism and human rights, when long-standing philanthropic and humanitarian concerns for children met (and partly entered) international politics. Even though the text of the Declaration did not go beyond listing a handful of commandments, its preamble still stressed its universal scope and applicability: the document constituted a general and programmatic commitment to children as human beings with specific needs, regardless of their race, gender, nationality or religion. Most importantly, the Declaration, which was translated into many languages and widely circulated to national governments, successfully and powerfully launched the idea of children’s rights. Even the fact that social reformers such as the Polish doctor and educationalist Janusz Korczak already criticised the Declaration within a few years of its passage for not being binding suggests the power of the ideas that it unleashed. Precisely for this reason, the document has come to be acknowledged as an important predecessor to later key documents in the history of global child welfare and children’s rights, such as the Declaration of the Rights of the Child (1959) or the United Nations Convention on the Rights of the Child (1989/90). Many studies have appeared in recent years concerning the history of child welfare in national and Western contexts. The following references focus specifically on child-centred activism in international contexts and the post-war developments. Baughan, Emily. ‘“Every Citizen of Empire Implored to Save the Children!” Empire, Internationalism and the Save the Children Fund in Inter-war Britain’. Historical Research 86, no. 231 (2013): pp. 116–137. Droux, Joelle. ‘L’internationalisation de la protection de l’enfance: acteurs, concurrences et projets transnationaux (1900–1925)’. Critique Internationale 52 (2011): pp. 17–33. Droux, Joelle. ‘Life during Wartime: The Save the Children International Union and the Dilemmas of Warfare Relief, 1919–1947’. In Dilemmas of Humanitarian Aid in the Twentieth Century, edited by Johannes Paulmann (Oxford: Oxford University Press, 2016): pp. 185–206. Kerber-Ganse, Waltraut. Die Menschenrechte des Kindes. Die UN-Kinderrechtskonvention und die Pädagogik von Janusz Korczak. Versuch einer Perspektivenverschränkung (Opladen: Budrich, 2009). Marshall, Dominique. ‘International Child Saving.’ In The Routledge History of Childhood in the Western World, edited by Paula Fass (London: Routledge, 2015): pp. 469–490. Marshall, Dominique. ‘The Rise of Coordinated Action for Children in War and Peace. Experts at the League of Nations, 1924–1945.’ In Shaping the Transnational Sphere. Experts, Networks and Issues from the 1840s to the 1930s, edited by Davide Rodogno, Bernhard Struck and Jakob Vogel (New York: Berghahn, 2015): pp. 82–107. Stornig, Katharina. ‘Between Christian Solidarity and Human Solidarity: ‘Humanity’ and the Mobilisation of Aid for Distant Children in Catholic Europe in the Long 19th Century.’ In Humanity – A History of European Concepts in Practice, edited by Fabian Klose and Mirjam Thulin (Göttingen: Vandenhoeck & Ruprecht, 2016): pp. 249–266. Katharina Stornig was a research fellow at the Leibniz Institute of European History in Mainz and has recently been appointed junior professor at the Justus-Liebig-Universität Gießen, Germany. Her main research interests include the cultural history of aid and philanthropy, the history of family and childhood, religious history, and transnational history. Citation: Katharina Stornig. ‘Geneva, 1924: The Geneva Declaration of the Rights of the Child’, in Online Atlas on the History of Humanitarianism and Human Rights, edited by Fabian Klose, Marc Palen, Johannes Paulmann, and Andrew Thompson, 2015-12, urn:nbn:de:0159-2016090557 [2019-04-26].